Nearly four years ago, the Pentagon put "Don't Ask, Don't Tell" out of its misery. 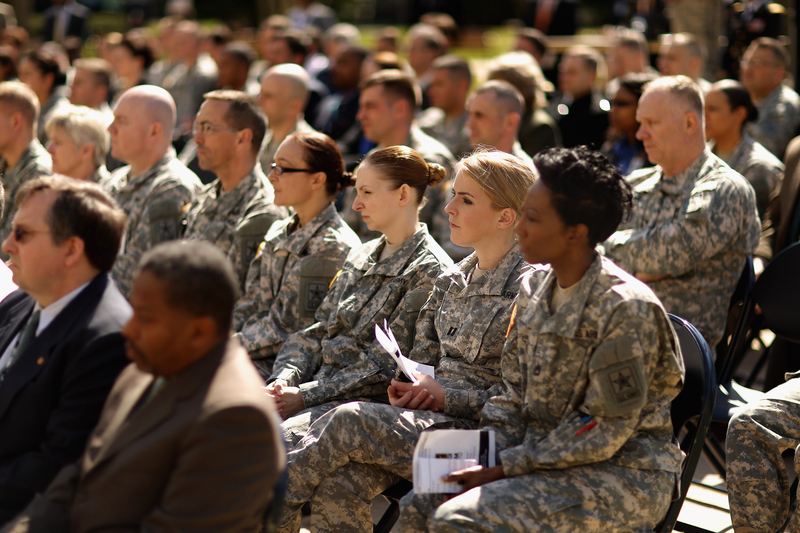 Now, it's preparing to extend equality to transgender servicemembers as well. The agency is preparing to review current policies on soldiers serving while transgender. It's putting a hold on discharges for trans servicemembers while it evaluates its existing framework and develops a new set of policies both for out trans members and for those who transition while serving. If the Pentagon does lift its current ban — which seems likely — it will be joining numerous other Western nations, including Israel, Britain, and Canada, in allowing transgender people to serve openly. It's been a long time coming for a nation with military policy that consistently remains a step behind those of its allies. The Defense Department's current regulations regarding transgender service members are outdated and are causing uncertainty that distracts commanders from our core missions...We have transgender soldiers, sailors, airmen, and Marines — real, patriotic Americans — who I know are being hurt by an outdated, confusing, inconsistent approach that's contrary to our value of service and individual merit. Advocates estimate that some 15,000 transgender people serve in the military currently, most living in secret. They can't access transition services or speak openly for fear of being discharged, and experience intense emotional distress because they can't live as themselves. While the military doesn't explicitly ban transgender members, a de facto ban leads to an unknown number of involuntary discharges annually. Some are rooted in the attitude that being transgender is evidence of mental illness — gender dysphoria continues to be listed in the DSM to ensure that trans people can access insurance coverage — and other such discharges are the result of bigotry, confusion, and other factors. Tellingly, the Pentagon doesn't have a system for tracking trans discharges, and many are hidden under the guise of another dismissal for cause. It's the epidemic that dare not speak its name. DADT covered LGBQ servicemembers, but it didn't address trans soldiers, aircrew, sailors, Marines, and others. Though the needs of these communities can overlap and intertwine — some trans people are queer, for example, some gay couples include trans partners — it's common for the trans community to be left out when people talk about "LGBQT victories." This policy change would welcome transgender servicemembers, allowing them to focus on mission readiness and their jobs alongside everyone else. The decision to specifically address trans issues highlights the dangers of lumping the transgender community in with the lesbian, gay, bisexual, and queer communities under the oft-used LGBQT umbrella. The needs of these communities are quite separate — the "LGBQ" is about sexuality, while the "T" is about gender. DADT covered LGBQ servicemembers, but it didn't address trans soldiers, aircrew, sailors, Marines, and others. Though the needs of these communities can overlap and intertwine — some trans people are queer, for example, some gay couples include trans partners — it's common for the trans community to be left out when people talk about "LGBQT victories." Pushing the trans community forward in these conversations is critical to make sure the T isn't routinely dropped. A working group to address the issue will operate on the assumption that transgender people are fully fit to serve, exploring the details of implementing a lift on the ban that currently restricts service for trans people. This reflects a growing trend at the Pentagon, which is reconsidering the way it evaluates "mission readiness," looking at ability and willingness to serve rather than at aspects of servicemembers' personal lives. The agency is having a similar conversation about women in combat roles, recognizing the changing nature of warfare and the fact that many women are already serving in de facto combat positions without eligibility for combat pay and other benefits. Ending DADT, looking at women in the military, and questioning the handling of trans servicemembers are all reflections of radical shifts in military culture under the Obama Administration. Faced with the legacy of two wars and countless national security threats, the Commander in Chief has taken a logical course of action by pushing the military to stop wasting qualified and talented personnel like gay Arabic speakers, female athletes fully capable of passing combat training, and transgender intelligence officers. While being transgender can present certain health care challenges — such as needing access to hormones and possibly time off for gender confirmation surgery — it doesn't preclude the ability to serve, even in remote or hostile areas. As the working group evaluates the issue, talks to servicemembers, and works with the trans community, members will be encountering some complex topics that need to be resolved, such as varying attitudes about transition and the fact that transition is an evolving and sometimes amorphous experience. It will also need to confront attitudes like bathroom panic, a subject that will no doubt emerge rapidly, thanks to widespread transphobia, especially in the conservative community. Already, conservatives are crying foul on the DOD's announcement. Fox's Erick Erickson commented on Twitter that transgender people are "mentally ill," for example, and he'll be joined by others. Some brave transgender members of the military have already come out, forcing the issue into the public eye and challenging notions about their fitness for duty. Their actions mirror those of their gay brothers and sisters who helped bring down Don't Ask, Don't Tell by refusing to remain on the down low. For every trans servicemember who comes out, people opposed to equality in the services have to question their attitudes, and the Pentagon has to reconsider its historic ban. Sergeant Shane Ortega, an outspoken advocate for trans rights in the military, is one such example — and he's eager to see how the Pentagon handles the mandate to reevaluate its stance on trans servicemembers. Chelsea Manning is perhaps the most famous face of transgender activism in the military, both for her exposure of classified documents to Wikileaks and for her very public coming out and subsequent fight for hormones and other treatments. After being convicted of espionage and sentenced to 35 years at Fort Leavenworth, the Army soldier was informed that she was not eligible for transgender care in military prison, per established precedent. After advocacy from her attorney, the ACLU, and other organizations, DOD officials provided Manning with hormones, psychotherapy, permission to dress as a woman, and a blanket ruling that she should be referred to by female pronouns and her chosen name. The establishment of a working group is exciting news for transgender servicemembers and trans people interested in joining the military, but it's not over yet. The group will be meeting for six months before making any final policy recommendations, and they'll likely face opposition, as well as a lack of knowledge about transgender issues that could hinder the development of comprehensive and inclusive policies. One issue that may arise, for example, is limited definitions of what "transition" means, and a possible insistence on "full transition," often defined by cis people as both hormones and surgery. Individual trans people pursue varying types of transition, and may find themselves straddling an awkward divide if they don't meet Pentagon mandates. The trans community and society in general need to have a serious conversation about how different trans people approach transition, and the dangers of assuming that only certain trans identities are valid. For example, a man who opts out of bottom surgery, or decides not to pursue it in the near future, is still a man. And this doesn't even get into the complexities of non-binary gender, a growing social topic. Meanwhile, people who are serving while trans are still holding their breath. While proposals for discharge on the grounds of gender identity are being put on hold, requiring review by high-level officials before they can be approved, being out can still be dangerous. Technically, such servicemembers can still be discharged, and they may also face discrimination and harassment from their comrades. Moreover, should the Pentagon decide to retain the ban, these servicemembers could be discharged after bravely coming out. Military service should be open to all Americans who wish to join, and under the Obama Administration, the Pentagon is breaking down a series of major barriers to service. Hopefully, transgender people in the military will soon seem as unremarkable as people of color and women serving — those groups, too, were segregated and excluded not that long ago.